Welcome to live coverage of the first monument of the season, Milan-San Remo. Good morning and welcome to our live coverage of Milan-San Remo. It won't be too long before the riders are on their way for the first monument of the season. It's a pleasant day in Milan this morning and the riders will have some good racing conditions. Here is Tom Dumoulin signing on this morning. As well as Dumoulin, Sunweb have Michael Matthews who has recovered from his horrible crash at Paris-Nice. Check out the full start list for Milan-San Remo, here. "Form, pedigree, aptitude; all signs seem to point to a Julian Alaphilippe victory at Milan-San Remo on Saturday, but the most straightforward Monument to ride also tends to be the most complicated to win. Therein lies its enduring appeal," writes Barry Ryan in his preview of Milan-San Remo. For that and more, click here. Why not also listen to our audio preview with the latest edition of the Cyclingnews Podcast, here. The riders have set off from Milan and are making their way through the neutral section. As ever, the Milan-San Remo neutral zone is quite long and makes the race almost 300km in total. Can Julian Alaphlippe continue his winning run in Italy at the start of this season and take Milan-San Remo. Alaphilippe has previously finished on the podium here, back in 2017, and this season he has won Strade Bianche and two stages of Tirreno-Adriatico. Deceuninck-QuickStep brings a very strong team to Milan-San Remo and Alaphilippe is by far not their only choice here with Viviani, Gilbert and Stybar all potential contenders. Another team with more than one option for today is Bora-Hansgrohe. They have Peter Sagan and the in-form Sam Bennett in their line-up. Bahrain-Merida have the defending champion in Vincenzo Nibali, but they also have sprinter Sonny Colbrelli. Dylan Teuns and Matej Mohoric could both cause some chaos in the finale, too, if they've got the legs after a long day in the saddle. Jumbo-Visma will be an interesting team to watch today. They have a few strong debutants in their ranks today with Dylan Groenewegen and Wout van Aert. Given that neither of them have ridden Milan-San Remo before, they're a bit of an unknown quantity and they could really throw up some surprises today. I've mentioned a few of them already but Ellis Bacon collated a list of 10 riders to watch for Milan-San Remo. Find out who made the cut, here. The neutral section is done and dusted and the flag for racing has dropped. 175 riders signed on this morning. The group is stretched out under the fast pace that is being set at the moment. A number of riders have been able to pull out a gap, but can they make it stick? The riders trying to get clear are Fausto Masnada, Mirco Maestri, Alessandro Tonelli, Guy Sagiv, Luca Raggio, Sebastian Schonberger, Joones Henttala, Andrea Peron, Charles Planet and Umberto Poli. That is a whopping four riders from Novo Nordisk in that group. Neri Sottoli, Androni Giocattoli and Israel Cycling Academy have representatices in there, too. The leaders have 1:20 on the peloton at the moment. Bardiani CSF also have two riders in that breakaway, which mean that all of the Italian invitees have made it into the break, while Cofidis and Direct Energy are the only wildcard teams without someone in the leading group. The riders are currently heading south towards Genoa (Genova) - the home of pesto. There won't be any time to stop and pick up a pot of the green stuff, as they turn right and along the coast towards their final destination of San Remo. The peloton is allowing this break plenty of space and they quickly build up an advantage of 4:15 over the bunch. With that settled, let's take a look at some of the other teams in today's race. Lotto Soudal has put pretty much all their eggs into Caleb Ewan's basket today with Tim Wellens taking a four-week break from racing. Ewan finished second in last year's race and has had a decent start to the season. His win at Hatta Dam during the UAE Tour last month shows that he's climbing well. Movistar has Alejandro Valverde in their bag of tricks today. It is the first time since 2016 that Valverde has ridden the monument and only his fourth appearance. He finished a career best of 15th in 2016. Mikel Landa is also racing after coming back from an early-season injury. One more for the road, UAE Team Emirates have two strong contenders in Alexander Kristoff and Fernando Gaviria. Kristoff won the event back in 2014, while Gaviria finished fifth in 2017. He looked in contention during his debut the year before, but crashed in the finale. Let's hope he can stay upright today. The peloton allowed the breakaway to build up a lead of over 10 minutes in the opening 30 kilometres. That appears to be the maximum they will allow and they have started closing the gap, slightly. The weather might be quite nice today but Milan-San Remo has endured some extreme weathers in the past. Most recently, the 2013 edition was almost cancelled due to snow. In the end, the riders were taken by bus over the Turchino pass and began the race there. Stephen Farrand spoke to some of the riders who took part in that edition and we collated a gallery of some of the best images from that day, here. Health and safety is a bit more of a concern these days. Not so much in 1910 where eventual race winner Eugène Christophe took shelter from the conditions in a farmhouse after being taken in by the farmer. He took ownership of a pair of long trousers before he carried on and won the race in a time of over 12 hours. He would subsequently be hospitalised for frostbite and spent a month in hospital. While stories like that are now the stuff of legend, I think we and the riders can be happy that we don't get editions quite like that these days. The average speed in the opening hour of racing is a reasonably quick 44.4kph. The gap to the escapees has been pegged back a little bit more. It's still pretty big, at this stage. Our 10 men out front have a gap of 8:30 over the peloton. Milan-San Remo is one of the hardest races for the breakaway to win. In fact, it is probably one of the hardest races to win, due to its unpredictability. In recent seasons, the earliest a breakaway move has been able to get clear is the Poggio. That doesn't stop riders trying and we can expect a few riders to have a go a little earlier than that today. With Milan-San Remo, we are getting into the heart of the spring Classics, which will culminate with Paris-Roubaix next month. Why not re-live some of the biggest moments from last year's Classics with our debut film THE HOLY WEEK. You can purchase it here. Want to join in, why not tweet me on @SadhbhOS or @Cyclingnewsfeed with your predictions and I'll post some of them here. Romain Bardet is riding Milan-San Remo for only the second time in his career. Bardet made his debut at the race in 2013 - his second season as a professional and finished an impressive 17th. He told reporters at the start that his aim is to hold onto the bunch until the Poggio, and then he'll see what he can do. "We’ll see, the legs will decide. I hope to be in a good position at the bottom of the Poggio and see if I have the legs to try something," he said. While the men are racing in Italy today, the women will be racing in Italy tomorrow. They will be riding the third round of the Women's WorldTour at the Trofeo Alfredo Binda. Kasia Niewiadoma will be looking to defend the title she took with a daring solo attack last season. A quick reminder of the riders in the breakaway: Fausto Masnada (Androni Giocattoli), Mirco Maestri, Alessandro Tonelli (both Bardiani CSF), Guy Sagiv (Israel Cycling Academy), Luca Raggio, Sebastian Schonberger (both Neri Sottoli), Joonas Henttala, Andrea Peron, Charles Planet and Umberto Poli (all Novo Nordisk). Their gap has leveled out at a bit over 8 minutes. There are five former winners of Milan-San Remo in today's race. They are Vincenzo Nibali, Michal Kwiatkowski, Arnaud Demare, John Degenkolb and Alexander Kristoff. In fact, there is just one active past winner of Milan-San Remo that isn't racing today. That is Mark Cavendish. The Manxman, who crashed heavily in last year's edition, is still on the comeback trail following a lengthy stint out of the 2018 season due to illness. You can read more about it here. Instead, Giacomo Nizzolo is leading the Dimension Data team. A number of teams have riders up front and controlling the peloton. UAE Team Emirates have been particularly active, but Lotto Soudal, Bora-Hansgrohe and Deceuninck-QuickStep all have representatives up there. The riders are racking up the kilometres nice and quickly as they pass through Pozzolo Formigaro after some 90 kilometres of racing. In around 40 kilometres, they will reach the first climb of the day, the Turchino Pass. It is the highest point of the whole race. The Turchino has been a part of Milan-San Remo since its inception. In fact, it has only been missed off the parcours on two occasions, 2001 and 2002. Of course, the riders also missed it in 2013 due to the snow. In the past, the Turchino often decided the race winner, but that is not the case any more. The peloton tackles the easier side of the Turchino. Nathan Van Hooydonck of the CCC Team is the first rider to abandon today's race. Meanwhile, the gap to the breakaway has dropped to 7:30. Going back to talking about the Turchino. As I said before, it has been used in all but a small number of editions. In the first edition of Milan-San Remo - in 1907 - it made a race-defining selection. Only 33 riders started the race, which started at the ungodly hour of 4am. After some 90km of racing, Giovanni Gerbi attacked on the climb in horrible conditions. At one point, he held a three-minute gap but he was eventually caught by Gustave Garrigou. The Frenchman eventually waited for his teammate Lucien Petit-Breton - who would go onto win the Tour de France that year. Petit-Breton would attack on the outskirts of San Remo and took victory by 35 seconds over his teammate Garrigou with Gerbi in third. With the Belgian Cyrille van Hauwaert winning in 1908, Italy would have to wait until Luigi Ganna in 1909 to get their first home winner. A great picture of the peloton at work today with Lotto Soudal's Adam Hansen at the helm. The riders have covered 110 kilometres. In any other race, they would be halfway (or close to) through the day at least but today they still have another 181km to go. The latest time check sees the gap grow back a little to 7:57. Milan-San Remo is so long that it has two feed zones for the riders. The first comes just before the Turchino with the second right before the three Capi after 220km. On a day like today, it is a fine balance trying to eat at the right times to prevent any bonking/hunger flats at key times. Speaking of eating, CCC Team reported that the reason for Van Hooydonck's abandon was stomach issues. Yves Lampaert is making his Milan-San Remo today. He is playing a support role for Deceuninck-QuickStep's many leaders. "It's only my first Milan-San Remo, I don't know what to expect. It's my job to drop the leaders in the top 10 at the Poggio. First, we play with Alaphilippe and Gilbert and if that doesn't work, we still have Viviani in hand for the sprint," he told Sporza. The rotation of riders at the front of the peloton continues and Bora-Hansgrohe and UAE Team Emirates are now setting the pace. Greg Van Avermaet has a decent sprint on him but he'll be hoping that today doesn't end in a bunch gallop. "I hope to attack on the Poggio. I will try to do as good as possible in the race and I hope that the tempo is high on the Cipressa so that it means that there are a lot of sprinters that are dropped already and then a bit of disorganisation on the Poggio can help me to do a good result," he said at the start. The average speed in the third hour of racing was 42.97kph. As the riders approach the first feed zone of the day, there is still time to listen to the latest edition of the Cyclingnews Podcast. You can find it here. Now onto the Turchino, the gap to the 10 leaders has dropped to 6:33. This photo shows the peloton all strung out under the pace set by some of the sprinter teams. Peter Sagan is riding a special edition Specialized S-Works Venge today. He presented the bike in Milan on Friday and you can take a look at it here. The Turchino has now been dispatched and there won't be any more climbing until we hit the first of the Capi, the Capo Mele, with just under 60km to go. The gap to the escapees continues to drop at a fair rate, to 5:50. The breakaway is now in Voltri and that means that they will now ride all the way along the coastline until they reach San Remo. Sebastian Schonberger had a puncture, but he quickly gets a new wheel and makes his way back to the leading group with no real issue. There was a second abandon a short while earlier with Sunweb's Casper Pedersen climbing off. The team has not yet confirmed the reason for Pedersen's early departure. While you're hear, let me take this opportunity for a shameless plug for our Classics film THE HOLY WEEK. It is a great insight into the week running from the Tour of Flanders to Paris-Roubaix. You can buy it for $2.49 or rent it for $1.99, a bargain. Click here to find out more. Today's breakaway, who now has 5:10 on the peloton after building a maximum lead of over 10 minutes. One team that we haven't seen up front yet is Cofidis. They have two sprinters that could do something today with Nacer Bouhanni and Christophe Laporte. Bouhanni's relationship with Cofidis has continued to deteriorate this season. It will be interesting to see if they will let him sprint for himself today or if Laporte will be the favoured son. Or maybe we'll see them sprinting against each other like we did towards the end of last year. A team with a more clear-cut leader is Team Sky, with Michal Kwiatkowski. The former winner had planned on missing this race, but couldn't keep himself away in the end. He is in fine form at the moment and finished third overall at the recent Paris-Nice. Team Sunweb have lost Casper Pedersen but they have a pretty strong line-up with Dumoulin, Matthews and Kragh Andersen. We'll have to see how Matthews fares here today as he's only had one full day of racing, and this is his first race back since crashing heavily on the opening stage of Paris-Nice. We're over four hours into today's stage, I hope you have snacks. The average speed for the peloton over the fourth hour 42.95kph. Whatever you think about the racing, there is one thing that you can't deny which is the beauty of this race. The speed is gradually ramping up as the race progresses and the breakaway is clocking a speed of around 45kph. John Degenkolb won Milan-San Remo in 2015 in what was a superb year for him. He went on to become only the third rider to win San Remo and Paris-Roubaix in the same season, joining Sean Kelly (1986) and Cyrille van Hauwaert (1908). Degenkolb has been on a bit of a rollercoaster - to understate the matter - since then but he was in a confident mood ahead of today's race. Read what he had to say here. We're into the final 100 kilometres. I feel like I've been here for days but we are closing in on the pointy end of today's action. The peloton is in a long line at the moment and they are 5:45 behind the breakaway. The last eight winners of Milan-San Remo have been first-time victors. The last repeat winner was Oscar Freire in 2010. He won it three times in total, in 2004, 2007 and 2010.
the last rider to win back to back editions of Milan-San Remo was Erik Zabel. He actually did it twice, in 1997 and 1998, and 2000 and 2001. Another stat from the fact file for you: Eddy Merckx is the rider with the most victories at Milan-San Remo. He has won it seven times. The next best is Constante Girardengo with six victories, while Gino Bartali and Erik Zabel are tied in third place on four wins. Only 14 riders have won more than one edition of Milan-San Remo. The gap is still coming down at a decent rate. The leaders have an advantage of 4:22 over the chasing peloton, which is making its way down a short descent. They have a small tailwind helping them along at the moment. The 2009 Milan-Sanremo was 11,734,272 inches long. Cavendish won by half of one of those inches. Direct Energie are moving up the bunch. They're one of the two invitee teams that aren't in the breakaway today, but they have reason to save their riders. They're looking after sprinter Niccolo Bonifazio, who finished fifth at the 2015 Milan-San Remo. Direct Energie - who were recently awarded a Tour de France wildcard - have also brought Niki Terpstra with them. His best finish at Milan-San Remo is 38th, but he could still be a good rider to try and get into the breakaway if he's up in the lead group closer to the finish. The riders are approaching the trio of climbs called the Capi, they are the Capo Mele, Capo Cervo and the Capo Berta. After that are the two key climbs, the Cipressa and then the Poggio. That's it from me today on Milan-San Remo live. I'm going to hand you over to my colleague Daniel Ostanek to take you through the final 70 kilometres of today's race. Daniel here. The break are into the final 70km now, 3:30 ahead of the peloton. Just 13km untli the break reaches the first of the Capo climbs – the Capo Mele. The peloton are slowly but surely eating into the break's advantage, which is down to three minutes now. Still, they'll be out there for a while yet. A bit of a tight squeeze in the peloton as they pass through a town with parked cars on their side of the road – not much margin for error there but everybody is through safe. Capo Mele for the breakaway now. It's 1km at 5% – not much of a challenge, but they'll all feel a bit different after 240km of racing. Down to 2:15 for the break now as the speed ratchets up behind. A mixture of teams on the front of the peloton now. Adam Hansen (Lotto-Soudal) is leading the way. 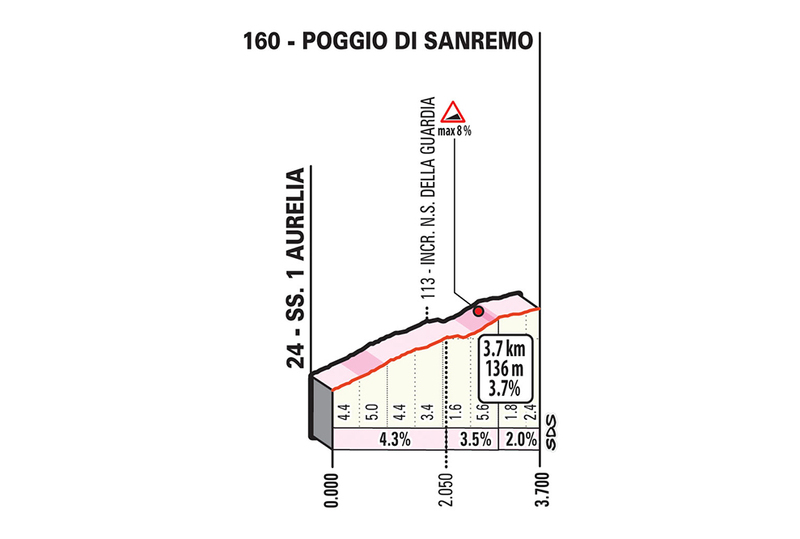 The break are cresting the Capo Cervo (1.6km at 3.1%) now. Next up is the Capo Berta, the toughest of the three climbs. All of a sudden the gap is down under a minute as the pace increases in the peloton. They're just 1:35 behind the break, and closing in metre by metre. And the break start going on the attack in response. It's Schönberger, followed by Maestri and Tonelli. Thre trio were on the attack at last week's Tirreno-Adriatico too, with Maestri taking the points jersey. Masnada is also following. Schönberger leads over the top of the Capo Berta. Masnada is alone out front now, riding through the smoke-filled road as fans let off flares near the top of the climb. The flares and smoke are no good for the riders, but they do give us an indication as to the wind direction. I just saw someone on Twitter point out that it's a headwind, and the smoke seems to confirm that. Not favourable for a late attack if that holds up. Masnada has fully committed now. He's out alone, while two riders from the break are caught by the peloton. Before we get into the real meat of the race with the Cipressa (around 12km away), here's one last shot of the peloton racing along the coastal road to savour. Kristian Sbaragli (Israel Cycling Academy) stops with a problem. Not an ideal point for a sprinter to be held up. Masnada is 10km from the Cipressa now. He's powering along in the big ring. The bulk of the break has been swept up now. Masnada remains, just 40 seconds ahead of the peloton. Masnada hits the Cipressa alone. The Sky-led peloton not far behind at all. Groupama-FDJ and Chris Juul-Jensen (Mitchelton-Scott) are up there too. At the rear of the peloton Owain Doull (Sky) is among the riders spat out the back. He's done a lot of work for his team today. A brave effort from Masnada but it's soon to come to an end. The peloton are just a few seconds back, with Astana driving it now. Magnus Cort is the man of the day for the Kazakh team. He's an outsider for the win, but can attack over the Poggio or sprint from a small group – definitely one to keep an eye on. The Dane won a stage at last week's Paris-Nice. European champion Matteo Trentin, world champion Alejandro Valverde, and three-time world champion (and current Slovakian champion) Peter Sagan are together in the middle of the peloton. A very select trio. And still Astana lead the peloton. Masnada is among the men heading out the back. It's not lined out at the front though, suggesting the pace isn't as high as it perhaps could be. Vincenzo Nibali hits the front! Just to grab a bidon, however. Lawson Craddock (EF Education First) hits the front to up the pace. Dylan Groenewegen (Jumbo-Visma) looks to be struggling at the back. Groupama-FDJ are back up front now. Arnaud Démare is their man for today, of course. He won this race back in 2016. The peloton are over the top of the Cipressa now. Nacer Bouhanni (Cofidis) is also positioned at the rear of the peloton. The Frenchman didn't have an ideal run-up to the race, finishing the opening TTT at Tirreno-Adriatico over the time limit. Niccolò Bonifazio (Direct Energie) is flying down the descent on the attack. He's a local so knows the roads. Bonifazio finished fifth on his Milan-San Remo debut back in 2015. I would've betted on him attacking on the Poggio rather than from this far out. Bonifazio and the peloton are on the flat road to the Poggio now. The peloton briefly splits before the dropped group (including Groenewegen and Bouhanni) make their way back. Bonifazio is 22 seconds up on the peloton now. The peloton are hardly exerting themselves however – they're spread across the road at the moment. CCC Team take it up on the front. Bonifazio has been brought back now. 10km to go. Racing through the smoke on the Capo Berta. A number of teams are up front now, as everybody fights for position heading into the Poggio. Here's a quick look at the Poggio. Sky hit the front. Deceuninck-Quick Step are also up there. The peloton hit the climb now! A high pace from Quick Step as they look to shed some sprinters for their man Julian Alaphilippe. Sagan, Gaviria, Ewan, Nibali – they're all up there at the front too. It's lined out now due to the high pace. Groenewegen is gone. Stybar and Gilbert are piling on the pressure up front. The helicopter shows Viviani and Bouhanni at the rear of the peloton. Groenwegen is hanging on at the very rear of the peloton. Quick Step still pushing. Alberto Bettiol (EF Education First) launches an attack! And Alaphilippe follows! Kwiatkowski follows! It's all kicking off now. The front of the race is in pieces now. Sagan, Trentin, Kwiatkowski, Alaphilippe are up there at the front. Wout Van Aert too! Naesen and Valverde are in the group too. They don't have a huge gap to the chasers. Dumoulin chases across. Sagan leads the way down the Poggio. Several more riders are in the background chasing on. Mechanical for Degenkolb on the descent. Cimolai, Simon Clarke, Mohoric are also in the lead group now. Trentin attacks with 2km to go! Trentin is caught. Van Aert is powering the group along. Group of around 11 riders heading into the final km. Looking around in the group! Sagan is on the front. Nibali is up there too! Alaphilippe hits the front! It's the Frenchman from Naesen on the line. A strange finish to the race but it's another one for Quick Step. Seven wins for Alaphilippe this season. What a crazy finish. Kwiatkowski took third, Sagan fourth and Mohoric fifth. "It's difficult to realise what I did and what my team did. They protected me all day. Tim Declercq was pulling all race and in the final we controlled and we make the race harder and I have to do no mistakes. "I was really focused to control the attack and with 600m to go when Mohoric went to attack I said its now or never. It's unbelievable - I saw my teammates after the finish and everybody was crying. "I need time to realise [what I've achieved] - I'm very happy." Alaphilippe crossing the line for win number seven in 2019, his biggest yet. "It’s something unbelievable for me. It’s my first podium at a Monument so it’s something that I will cherish. "I had a chance but I think that [Alaphilippe] was untouchable today. He was the strongest on the Poggio, he launched a sprint from very far out in a headwind against some very strong riders like Kwiatkowski, Sagan, Trentin. He held everyone off, so I think Julian is the deserving winner. "I had a lot of confidence going into this race, but when I talk about confidence I thought maybe I would be top 10. I was hoping for a podium, but I didn’t expect it. This is not a race that suits me well, but now I’m ready for the cobbled Classics in my home country of Belgium." "Of course it’s a good result to be on the podium but when you’re so close to the victory of course you’re thinking if you could have done anything better to win it. It would have been a dream to win today but Julian was the strongest rider today, that’s my opinion. "I think everyone say what he did on the Poggio and then having the legs to sprint was quite impressive for him. Being among the best riders in a small group was a nice feeling and there were plenty of attacks, and I think it was a great race to watch. I’m very happy that Team Sky gave me the opportunity to go for another one." Let's not forget the great efforts from the two 24-year-olds Mohorič (fifth) and Wout Van Aert (sixth on his debut) today. Mohorič was on the attack in closing kilometres and launched the sprint, while Van Aert chased down Trentin's attack off the base of the Poggio. You can head over here for our report on the race, as well as photos and results. The full report will be up soon. Here's a great image from the finish, courtesy of Bettini Photo. Zdeněk Štybar, Philippe Gilbert, Yves Lampaert and Elia Viviani cross the line in celebration of Alaphilippe's win. And the stories from Milan-San Remo are starting to come in. Here's Stephen Farrand's piece on Peter Sagan, who was disappointed to finish fourth today. Here's Dan Benson's story about Michał Kwiatkowski, who finished third today at Team Sky's final Milan-San Remo. Oliver Naesen (AG2R La Mondiale) took the first Monument podium of his career today. Here's the story. Here's the big story from the winner, Alaphilippe, courtesy of Stephen Farrand. Matej Mohorič shone with a fifth-place finish at today's Milan-San Remo. Here's our piece on the Slovenian. Another article from the aftermath of the first Monument of the season, Milan-San Remo. This time it's Elia Viviani talking about Alaphilippe's amazing early season and his own race. We're nearing the end of our Milan-San Remo coverage today. Here's our piece on the race highlights, including a quick recap video.